The term Post traumatic stress is heard often these days—on the news, in blogs and articles, in professional journals—almost to the point of confusion and overuse. But back when I suffered some of its symptoms following my husband's death, most people were unfamiliar with it. PTSD results from an extreme experience, one so overwhelming you don't (or can't) respond in a normal way, 'normal' meaning with acute anxiety and depression that diminishes within a reasonable period of time and that does not, to a disabling extent, affect day-to-day life. For me, it was finding my physician-husband in the aftermath of his suicide. Overwhelmed is not the right word for what I felt. I was hysterical. Literally. I could not stop screaming until a nurse grabbed my shoulders and gave me a forceful shake. For a period of years afterward, I was haunted by flashbacks of that moment and vivid, unreal images that made me feel crazy. Leaving home could fill me inexplicably, unpredictably with dread. I can remember needing a few things one afternoon—cat food, milk, detergent. I sat in my car at the grocery store with my heart pounding, shaking, panting shallow breaths as though I was about to face a firing squad. I had nightmares until I was unable to sleep; I walked my neighborhood street in the middle of nights when I could not bear to be in the house alone. I began to work with the elderly because I felt I had no future, and I was drawn by their nearness to death. I drove for miles out of my way to avoid any glimpse of the huge hospital complex where my husband died. In 18 years, I have not been back to this hospital to see the oil portrait of him, alongside others whose medical practice was worthy of the honor, on the wall of one corridor. This was my experience of post traumatic stress. I told a few friends about the insomnia, but not the rest. I lived with it until finally these problems receded. I still struggle with unrealistic anxiety when someone I care about isn't home when they're supposed to be; I'm unable to keep myself from imagining the worst. I still avoid contact with the hospital and would, even to the detriment of my own health. But I will drive by it now. I understand what it is to feel that you cannot control your own mind and emotions in the wake of a deeply disturbing shock. I cannot even imagine what living through combat in a war must be like. However, Matt Myers, who's helping to moderate this page, dealt with his father's PTSD throughout childhood. I invite you to read his story. This page is a place for people to ask questions, share advice about friendship and tell their stories. Send your blogs, links for the resource page, suggestions and questions. You can email mary@allweatherfriend or click Connect on the top nav bar and use the form you'll find on that page. My dad was a disabled Vietnam vet. He was bound to a wheelchair, having lost his legs in a double claymore mine blast in the jungles of Cambodia. Even though his physical wounds were obvious, as a child I never thought of him as disabled. He drove a pick-up truck with hand controls, hunted and fished, drove an ATV, mowed our grass, and did chores around the house. He was a carpenter, a welder, and a gunsmith. He could find a way to do anything he wanted to do. He was warm, and kind, and funny. He loved to make people laugh. He loved to play the guitar and sing. He had many characteristics that made people want to be around him, and he was well-liked by most everyone he met. But there was a secret side of him, a dark side that most never saw. He was sullen, emotionally distant, easily frustrated and quick to anger. When he got mad he was scary, and when he got really mad he was terrifying. He carried a pistol everywhere he went, and at night he kept it on the nightstand by his bed. On the outside Dad appeared to have everything together. He had a wife, two kids, two cars, a nice house and a nice middle-class life in a suburban neighborhood. On the inside, Dad was still in Vietnam. In the evenings he would say goodnight to his family, and relive the horror of the war in his dreams. Night in and night out, the ghosts of war wouldn’t let him rest. In an effort to silence them, he started abusing his pain medication. As the years went by and Dad’s drug addiction got worse, our home became a war zone. Screaming, shouting, crying; for over 25 years, every day was a different kind of battle. Sometimes when the fights got bad Dad would threaten to kill himself. A couple of times he came very close. Dad knew he had PTSD, and he knew he needed help, but once the drugs took hold of him he couldn’t let them go. He made attempts at counseling, but they all ended in failure. After an extended illness, Dad passed away in 2011 at the age of 61. He never made peace with Vietnam, with the things he saw and did. In his final days, when he knew he was going to die, he told me he was afraid of going to hell. Later that year, my wife and I lost our first child to miscarriage. My life started to fall apart. I had severe outbursts of anger and terrible nightmares. One day at work I had the first of a series of flashbacks. I eventually had to leave my job and go into therapy to pull myself together. As difficult as that period was, it was only the culmination of a lifelong fight. Throughout my life I’ve struggled with PTSD. I’ve battled depression, nightmares, anger, fear and paranoia. I’ve felt a deep sense of isolation and disconnection from the world around me. I’ve lived for many years in what author Peter Levine refers to as a “functional freeze,” a feeling that I’m observing my life without fully engaging in it. During some of my worst periods in my late teens, I would sit on my bed staring out the window for hours at a time. I’ve been in therapy on and off for the last twelve years. Today I’m 39 years old and live in a small town with my wife and our four children. I’d like to say I’ve overcome PTSD, but the truth is that my recovery is still a work in progress. I’m looking forward to sharing the journey with others who have suffered with PTSD or have been affected by it. Contact me by email (mtmyers3@yahoo.com). From Matt: With PTSD, there is a strong need to talk about the trauma with other people and an equally strong fear that other people don't want to hear it. Trauma can be horrible and terrifying. In my experience, the sad truth is that most people don't know how to handle it, so they shut you out. 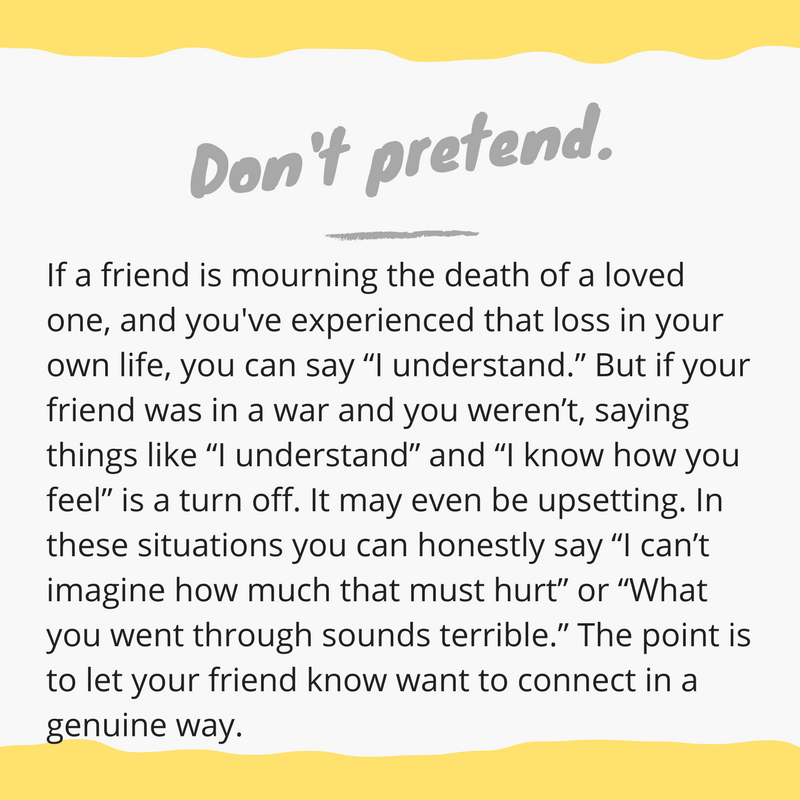 Click the arrows for some of Matt's tips about helping friends coping with PTSD.